The “winner takes all” principle seems to be less relevant to a startup business model than to a corporate business. Why so? The thing is that a cumulative advantage inherent in a contemporary globalized economy when the bigger you are the more chances you have for a further growth works beyond poorly regulated environments to which startups belong. The startup phenomenon in general and the IoT startups in particular are too immature in terms of a business-model history. In contrast to corporations, startups feel good in a Black-Swan-friendly uncertainty of emerging innovations. They operate in risky fields, they gamble oftentimes. But an immense focus on their own topics is what helps them survive. Indeed, dedication is an antidote to risks. Imagine a corporation leading in some particular sector which is going to develop a new product. What primary constraints does the corporation’s leadership face? Neither statistically calculable chances for a commercial success of a new product nor a budget necessary for the development are implied. Shareholders’ fears, insidious foresight of rivals, overcomplicated pre-development workflows, and quite a possible coldness of consumers (yes, startups can make an analog faster and cheaper) constitutes a set of the initial doubts any corporate CEO has to take into consideration with regard to any new product even if the idea of the latter is great. Startupers act in a different way. While famous IoT companies look for sustainability in development, the IoT startups bet on disruption. A new IoT application must impress an audience with both affordability and usability. It can show the way how to do something better, achieve something faster, and make life easier after all. The majority of top IoT startups do not reinvent the wheel - they improve user experience with their IoT products and services. And this is the very essence of risk in innovations to offer addressing issues from a different angle. Nevertheless, the basic principle of evolution (as well as of capitalism) remains here to stay: the fittest will survive. Let’s see through which business ideas the following 7 best IoT startups cope with challenges of putting their skin in the game. The basic idea reflected on the Hologram.io website comes to a global unification of cellular connectivity for IoT devices. The startup offers a solution capable of reconciling IoT gadgets in 196 countries through a single universal hardware-agnostic SIM card. Connection scalability is important for the IoT devices that regularly change their locations. It hints at rather the industrial-oriented IoT devices than smart-home applicable ones. 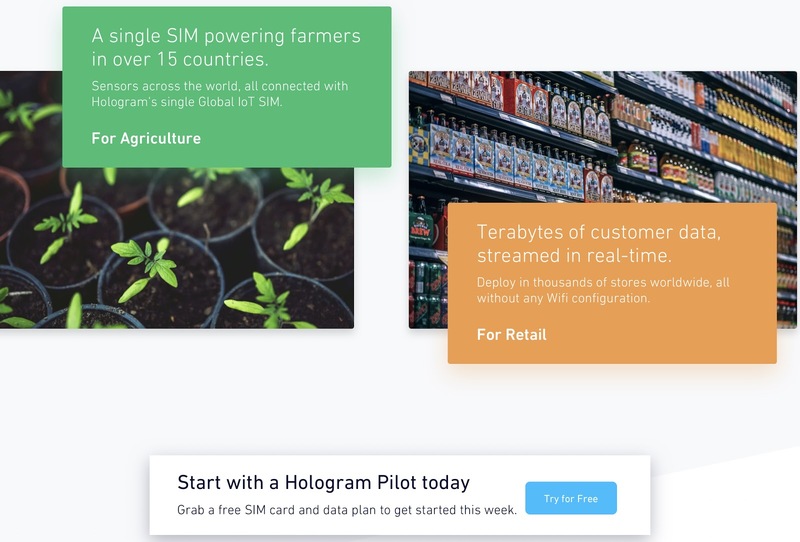 Everything falls into place when the Hologram’s use cases are considered: connected fleets and asset tracking, IIoT solution for agriculture, and customer data processing in a smart retail. In accordance to Hologram.io, hundreds of thousands of happy customers are already available. What is the Hologram’s appeal to the future? Since their link to a total inevitable globalization is categorical and unequivocal, the startup can hardly become obsolete in the nearest perspective. Are they risk takers? As any other IoT startup they certainly are. But our gut feeling suggests Hologram will succeed. In accordance with the Cambridge dictionary, the “samsara” word means a cycle of repeated connected events such as birth, death, and rebirth in Buddhism and Hinduism. Being one of the top LinkedIn startups of 2018, the company has chosen such a name for a reason. 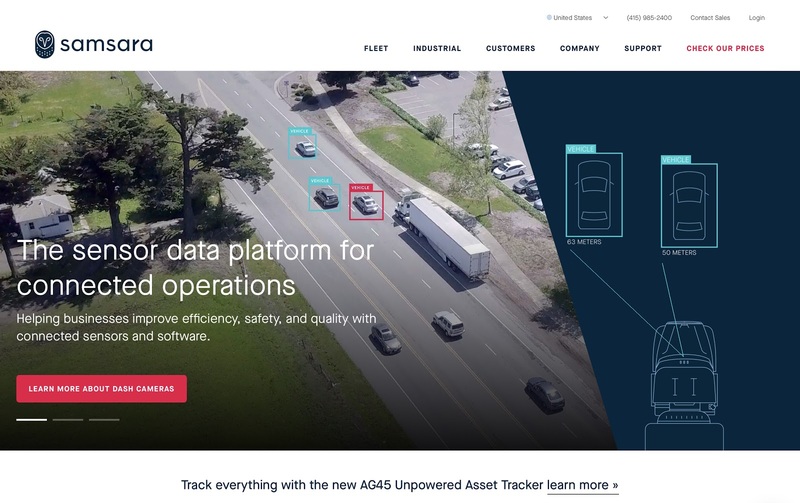 Combining a special cloud-based IoT software with a plug-and-play hardware, Samsara aims at a real-time tracking of a wide range of sensor-equipped vehicles and equipment whose modus operandi implies cyclic workflows. Another possible reason for having quite an unusual name can lie in the origin of the startup’s founder Sanjit Biswas whose previous startup Meraki (not less exotic name, right) was acquired by Cisco for $ 1.2 billion, by the way. Samsara positions itself as a fast-growing international (its offices are located in San Francisco, Atlanta, London, and San Jose) IoT provider whose hardware-software solutions allow users to benefit from numerous data collected and processed with Samsara. The startup’s team believes that such sectors as transportation and logistics, construction and manufacturing, food production and energy generation can significantly improve the efficiency of their operations through saturating their working environments with sensors. Both the seriousness of approaches and gravity of ambitions of Samsara are implicitly confirmed by the amount of funds the startup has already raised - $ 230 M (Andressen Horowitz is one of the investors). Even a huge corporation could boast about such an investment performance, not to mention a startup. In a combination with 700 employees and 5000 available customers throughout the world, the development indicators of Samsara really impress. Nobody should doubt in a business success of Samsara even if competitors in the IoT sector keep proliferating - Samsara has too good initial conditions to fail. Have you heard about the Internet of Radios within the IoT? This is what Bastille is focused on. The core idea of the startup’s software-hardware solution is as simple as genius: identification of any active device emitting radio waves in your corporate space to figure out what data might go out in an unauthorized manner. This is about the next level of a corporate security in the days when IoT devices keep infiltrating more and more working environments. 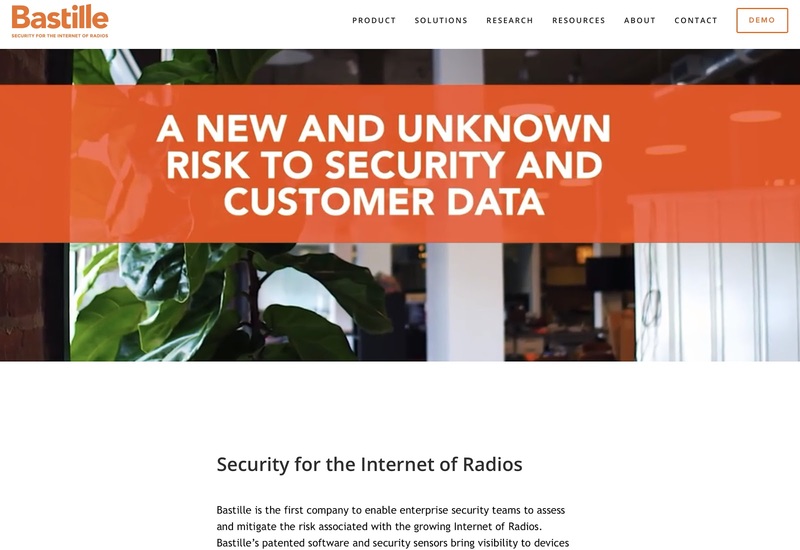 Since the frequency range of 60 MHz to 6 GHz covers almost all available IoT connection protocols including Wi-Fi and cellular networks, the task of Bastille comes to scanning particular environments within the radio frequencies. Fear to be hacked is a powerful stimulus capable of making any corporation shell out for the solutions from Bastille. By the way, “Bastille” is a fortress in Paris which is historically famous for being used as a state prison by the kings of France. Hence, any spy data-generating IoT device is considered by the startup as a prisoner incapable of breaking through walls of the Bastille digital fortress. No need to explain that breaches and leaks of corporate data is one of the major threats in a present digital economy. The bigger amount of data you generate, the bigger chance of being hacked occurs. Add a wide variety of proliferating IoT devices to this principle, and a strategic calculus of the Bastille startup becomes easily graspable: you will hardly be able to invent a universal guard solution for all available connection protocols, brands, and types of the IoT. However, as the ancient Romans used to say, “forewarned is forearmed”. And alarming through radio-wave detection is what Bastille provides various IoT users with. Undoubtedly, the startup has found a perfect niche in the IoT realm to stay in demand for years - data security. Predictive maintenance is probably the earliest and most obvious IoT direction in the industrial sector. Any Internet of Things technology allowing infrastructure managers anticipate failures has a strong chance to be accepted in many industries. Nevertheless, the startup from München (Germany) chosen a niche whose perspectives seemed ambivalent. On the one hand, the industrial predictive analytics is what many IoT Companies are involved in. It implies quite a fierce competition. On the other hand, engineers from Konux understand that the continuously growing Internet of Things market can always accept another end-to-end IIoT solution in the light of the ongoing global digitization of industries. Besides, Konux seems to follow one of the most famous recipes of success in the era of specialization: be as much specific as possible, and a particular market share you occupy provides you with a personal micro monopoly. That’s why Konux focuses on continuous monitoring of such key switch components as the track bed and frog. A combination of sensors and cloud-based software reveals the health of the assets of Konux’s customers. It goes in line with a general purpose of the IIoT predictive analytics - providing users with actionable recommendations before any failure may happen. 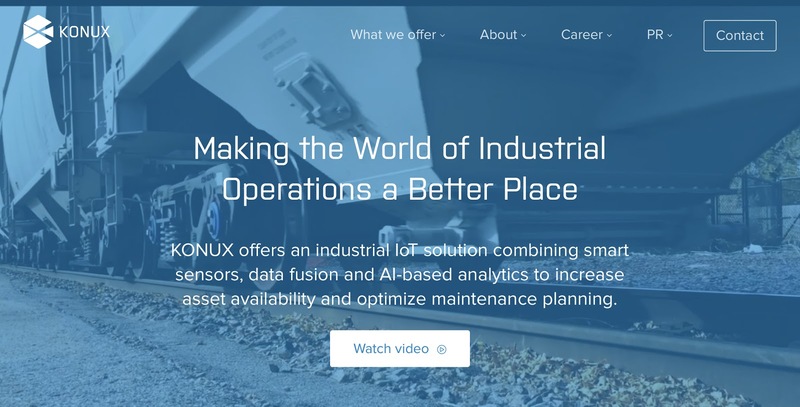 Those who are aware of the traditional German thoroughness can safely assume Konux succeeding in one of the narrow-specialized sectors of the industrial IoT. This London-based startup believes that literally everything (see the name) can be and must be enriched with one or another sort of data. For what? To make everything fit the emerging data-driven economy, of course. Endowing material commodities with digital identity facilitates markets in many aspects. Billions of items in retail, for example, can appear easily handled through industrial IoT systems of data management. Making the entire supply chains reliably visible can significantly improve brand trust through a digitally empowered authentication. 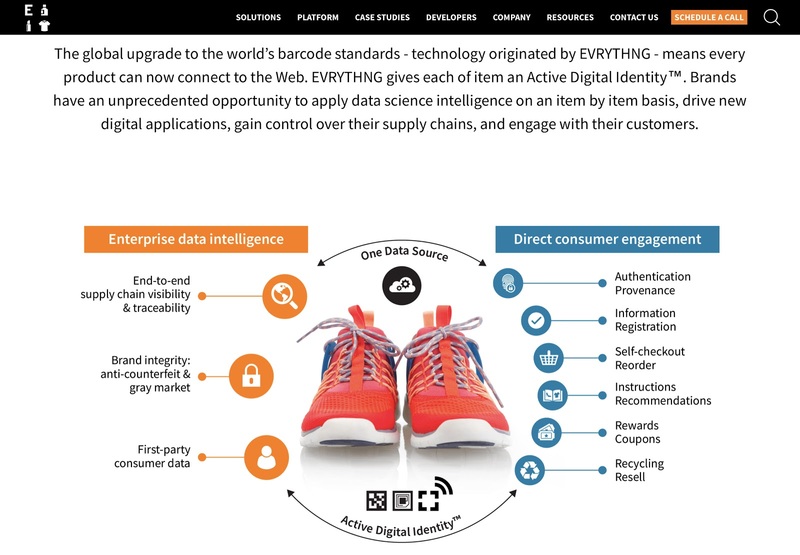 The EVRYTHNG IoT SaaS platform is aimed at making every product smart and trackable. This mission corresponds to the Company’s commitment of being one of the best IoT startups. Their SaaS business model allows users to be focused on building engagement in customer relationships while the platform provides their product data aggregation and processing. This is just the sort of service destined to remain in a great demand among many businesses capable of recognizing the promise of the IoT. The Evrythng startup advocates its original intelligent approach to product management efficiently: Coca Cola, Carrefour, and Henkel have become the startup’s customers already. And we hope this is just the beginning. Some extra capabilities enforcing your IT security will never hurt. This is clear for the Israel-based IoT startup Axonize. Another aspect of providing IoT security evident for the guys from Axonize is that time and efforts of the end customers cost a lot. That’s why the startup offers some sort of the risk management unification through a platform which reduces complexity of integration of any sensor with IoT applications. Even though the notorious KISS (Keep It Stupid Simple) approach is not always applicable to the IoT environment, the simplification of IT development arrangements is what many users expect from the internet startups. And Axonize shows the way. The guys demonstrate a deep knowledge in determining the biggest challenge in the IoT development - arranging an advanced system integration through minimal DevOps resources. How to pull together numerous customer needs and your engineering and infrastructural capabilities in a proper and scalable manner? Take a look at what Axonize offers. Their platform allows to run and manage multiple IoT applications with a special “master” layer acting as a hub. Such features as customizing widgets via a powerful dashboard builder along with triggering automatic actions via a special rules engine are available. 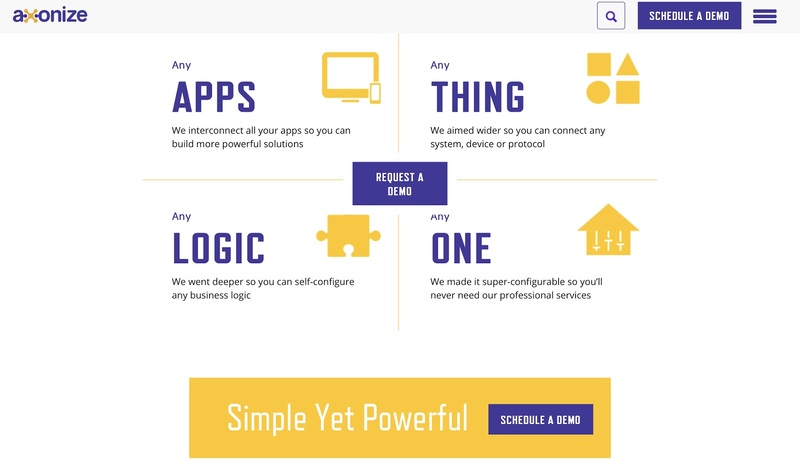 Fast, secure, and efficient IoT app deployment is possible - practically proved by Axonize. 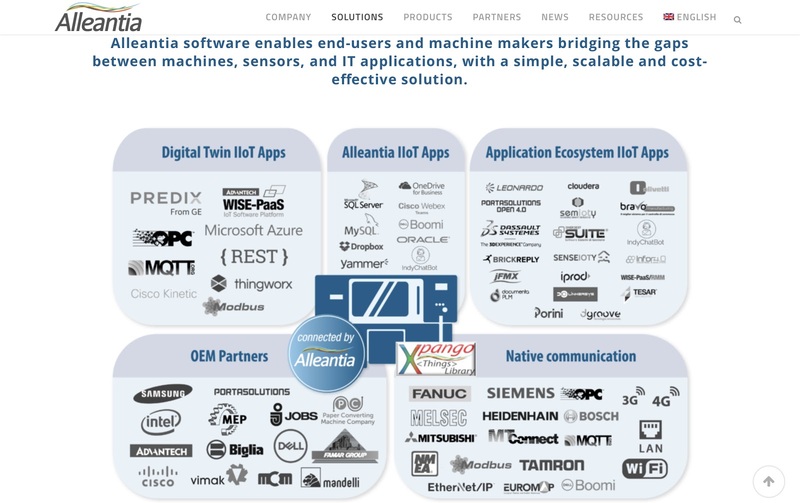 In order to make the statement that any industry benefits from digitization self-evident, the Italy-based IIoT startup Alleantia shows how dozens of industrial manufacturers can be interconnected through the IIoT. Sometimes, statistically ample lists sound sufficiently persuasive, right? But in case of Alleantia it is not just a self-PR trick: the already available hundreds of deployments of the Allentia’s edge software prove the cost efficiency of the IIoT within Industry 4.0. The startup’s solution encompasses numerous IIoT apps from various partners as a “shell” all-in-one software. Being focused on a large corporate industrial sector, Alleantia does not play with opportunities - it is too risky to conduct dubious experiments when your official partners are Mitsubishi, General Electric, and Cisco to name a few. A set of the offered certified edge gateways from Cisco, Dell, and Advantech fully compatible with the Allentia’s software (which runs on almost all versions of Windows, Ubuntu, and XUbuntu) is another heavy argument to take seriously what respectable hi-tech media say about Allentia: “...“Alleantia with ISC software is a reference vendor for factory automation, energy and utilities, transportation” (Market Guide for Industrial IoT Gateways by Gartner). The given Top 7 IoT startups are different in both their specializations and ambitions. Some of them bet on quite narrow domain-specific IoT solutions, the others strive to cover as many divergent IoT sub-sectors as possible. But what combines all of them in a cohort distinctive from a corporate “business-as-usual” paradigm is an ability to take the risk of being disruptive. The IoT startupers propagate innovations capable of making the end customers’ life easier through various solutions making their businesses more manageable and thus more beneficial. Just the satisfied (or unsatisfied) customer expectations determine a market share of one or another IoT startup in a rapidly changing data-driven economy. The risk of failure will always remain as well as those brave guys who can take the risk. And the technological development will keep moving forward until startups remain startups. How Much Does It Cost To Create IoT Solution?